Dramatic cell phone video captured by a California family shows a desperate attempt to escape from the Valley Fire that’s been burning since Saturday. Julie Wolf, a long time resident of Anderson Springs near Middletown, was unaware of the massive fire burning in the area until her son and daughter-in-law visiting from the Bay Area told her about it later that day. Her son, who was in the car in front of her, captured the dramatic 8- or 9-mile drive through the inferno. Wolf and her family, who did not know of the mandatory evacuations ordered around 4 p.m., decided to leave the house at 8:30 p.m. The family saw just how devastating and massive the fire had grown once they got on the only road out of the small community toward Middletown. After sparking Saturday afternoon, the Valley Fire has charred in excess of 95 square miles and ripped through the town of Middletown. The Valley Fire has scorched 67,200 acres in Lake, Napa and Sonoma counties and claimed a life. More than 13,000 people have been displaced from their homes and forced to take shelter at evacuations centers due to a massive wildfire bursting through Northern California. 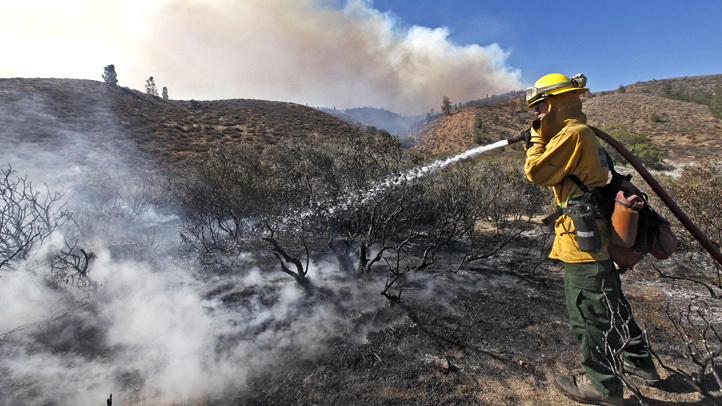 The fire is 30 percent contained, Cal Fire said late Tuesday.